Our next competitions will be Wednesday, 9 January 2019. We will have color prints and monochrome prints. You may enter three in each. The theme this month is Open, so any subject is good. Competition rules, which include how to prepare your entries are posted on our website. We had a good turn out at Brian Boru’s the other week for the photoshop/lightroom talk, so decided to do a piggy back session from that and have a peer review on Thursday, October 4th, 2018 at 6:30pm at Sin Fronteras Cafe, 7748 Ritchie Hwy, Glen Burnie. Please bring 3-5 photos that you would like your peers to critique. Please bring 5×7 or 8×10 of ones that you have been working on in photoshop/lightroom. Please do NOT put your names on your photos, as we will be mixing them up and randomly giving each other photos to critique and passing them around the table. Come hungry and ready to critique. Each person is responsible for their own food and drink purchases. Looking forward to seeing many of you there! Please RSVP here to this email so that I may book for reservations. Join us for a fun day of photography in The Big Apple! We’ll depart from Long Gate Park & Ride promptly at 7:00 AM, and return around 11:30 PM, Saturday, October 20th. Rain or shine, we’ll have plenty of great photo opportunities! We’ll be dropped off in midtown Manhattan, start our day at Grand Central Station, and work our way downtown, through Times Square, the Highline, visit the Oculus & World Trade Center complex, head over the Brooklyn Bridge, and into DUMBO (Down Under Manhattan Bridge Overpass), Brooklyn. Our bus will pick us up there! We will have tentative itineraries for those that are up for an extensive walk, and one for those wishing to hop the subway or taxi. Of course, you are welcome to peel off on your own too. Cost is $50.00 per person. Non-CMPG members are welcome, so bring a friend! Fee covers round trip motor-coach transportation, snacks and beverages on the bus, and gratuity for the driver. All other expenses are the responsibility of participants. Should you decide to explore the city on your own, you are welcome to do so. Anyone not back at the bus at departure time will be responsible for their own return transportation. Locations subject to change, based on weather and circumstances outside of our control. All participants will be required to sign a waiver to participate. Due to the nature of this event, we cannot offer refunds, unless we are able to fill the seat with a paid waitlist participant. Deadline to register is September 18th. Should we not have enough paid participants by this date, the trip will be cancelled and fees refunded, so please book today! Join us at the 155th Gettysburg, “A Living History” event at the historic David Stewart Farm. This event is reenactor coordinated with all new historical presentations. Meet the generals from both armies. Visit the living history camps. Hear civilians tell of their experiences – watch out for soldiers searching for food! See the artillery, infantry and cavalry. Check out the large tent of activities for kids of ALL ages. Join us for a Saturday evening camp dance. Attend education and preservation programs in the speakers tent. Visit our Sutlers, food vendors and have your tintype photo taken by the one and only John Milliker! Spectator admission fee is just $20 per carload and payable at the entrance. ALL proceeds from this event will be donated to battlefield preservation. Backpacks and coolers are prohibited. All persons entering the event are subject to search for the safety of us all. For further Information: www.cwhi.org. Michelle Barkdoll will be there all 3 days – if club members get in contact with her prior to coming – she will be able to get them to different photo advantages during the day along with the battle. 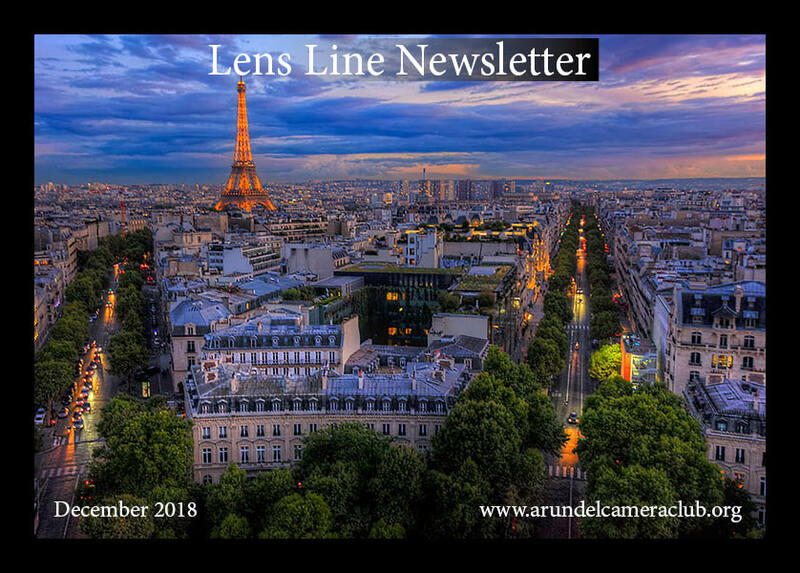 Email Michelle at fieldtrips@arundelcameraclub.org. April 28, 2018 will mark the 40th year for the oldest Celtic celebration in Maryland. The Southern Maryland Celtic Festival and Highland Gathering highlights the heritage of the Breton, Cornish, Irish, Manx, Scots, and Welsh. The Celtic Festival is a one day only event held at Jefferson Patterson Park on Mackall Road in St. Leonard, Maryland, just south of Prince Frederick. Drive time from Severna Park High School is about 90 minutes, taking route 2 south to route 4 to Broomes Island Road to Mackall Road. Admission is $25 at the gate, $20 on line if purchased ahead of time. Event runs 10 a.m. to 6 p.m. Festivities include vendor booths, food, art, competitions in Highland Dance, Harping, Heavy Athletics, Pipers and Drummers. Bob Can’t make it. Anyone interested in Car pooling email Susan Webber (56SueW@gmail.com). 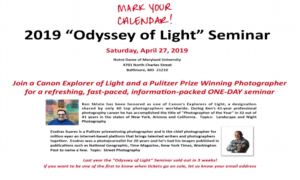 The Central Maryland Photographers’ Guild (CMPG)is pleased to announce a very special event! There is nothing more important than clean, direct, compelling composition. Through numerous image examples, various compositional techniques will be illustrated and discussed. From the basics of composition to more creative ideas, Tony’s presentation is intended to fine tune the vision and jump start the creativity of the attendees. Whether you are just starting out, or are a seasoned pro, this is a program not to be missed! Tickets are $20 with advance online registration, or $25 at the door (cash only, please). Doors will open at 6:30 PM, with light refreshments. The program begins at 7:00 PM. A Q&A session will follow Tony’s presentation. Joe Miller and the Northern Virginia Alliance of Camera Clubs present “The Freeman Patterson Lecture on Understanding Creativity” on Thursday, May 3 at 7:30 p.m.
Mr. Patterson, a world-renowned photographer and teacher, will discuss the idea of “Creativity” as applied to photographic work. His personal efforts range from documentary to impressionistic; resonating with themes inherent in the natural world. His images have been published in numerous books, magazines, journals, newspapers and advertisements, exhibited around the world. Freeman will begin his presentation with a talk about the nature of creativity and ways to nurture and develop the creativity with which we are all born. He includes stories of people who have used their creativity under great difficulty to benefit others and follows with a series of photographs (with commentary) that illustrate his main points and reveal how both the symbols in our dreams and the symbols in our art tell our life story. Freeman has presented this program in several countries – Australia, New Zealand, South Africa, Israel, France, England, Canada, and the United States – and regularly updates both the spoken and visual content. It is a continuing work in progress. Combining a deep love of photography with an open and engaging teaching style, his lectures emphasize learning how to express effectively what you see and feel. He regards visual design as the craft or the language of visual expression and helps his students become fluent; using design with the ease of speaking their first language. He helps attendees to understand that creativity resides in them (the photographer) and not in the tools or techniques that are used. Without an imagination, dreaming, and manipulation, tools and techniques can accomplish nothing. Carpooling for this event is suggested due to limited parking space. Date: Thursday, May 3, 2018 at 7:30 p.m.
Our next Print competition will be Wednesday, 11 April 2018. We will have color prints and monochrome prints contests. You may enter three in each. The theme this month is Surrealism, “Surreal photography would be more about creating a world or image which goes beyond the physical world as we know it. It usually shows something which would be impossible in real life or tampers with the line defining what is real and what is imaginary. Surreal = beyond the real.” You can find examples of surrealistic photos by clicking here.